Séraphine is a 50ish battle-axe of a woman at the turn of the century who cleans people’s houses and rarely pauses to hold a conversation. We see her on hands and knees, scrubbing a floor; or perhaps rolling a hand-cart full of linen down to the river to scrub them. Always, we see her barreling through town with that distinctive gait — legs awkwardly apart, back hunched a bit, mouth clamped shut, hat propped on her head. No wonder the other residents of the little town of Senlis keep her at arm’s length, reckoning her a bit simple and certainly unrefined. Little do they know she keeps herself awake at night with her own concoction of “energy wine” so she can paint. She paints furiously, ecstatically. She paints because she can’t do anything else. She paints through the instruction of her guardian angel. 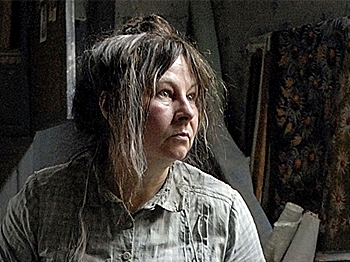 She paints using colors she concocts with candle wax, pig’s blood, clay, wildflowers. And when she paints, she sings. Why did I love this film so much? Perhaps it’s Yolande Moreau in the lead. You know her from the films of Jean-Pierre Jeunet (Amélie , Micmacs ) and Olivier Assayas’s sweet Paris, je t’aime (2006) — or, if you’re lucky, you’ve perhaps seen her lovely When the Sea Rises (2004) — but you probably haven’t seen her do what she’s so good at: use her expressive face almost as a mime would, to evoke mirth and melancholy all at once from her pathos. I also loved it for its treatment of Séraphine’s idiosyncratic religious vision — her love of hymns, her love of nature (she will, on occasion, hug a tree or speak to flowers), her ecstasies, all of which inspire her art. Also the film’s appreciation for her drive to paint. Anyone engaged in the creative process will appreciate this woman’s propulsion, her single-mindedness. You’ll recognize the madness that drives us. But best of all was the long, slow lead-up to showing us Séraphine’s art. 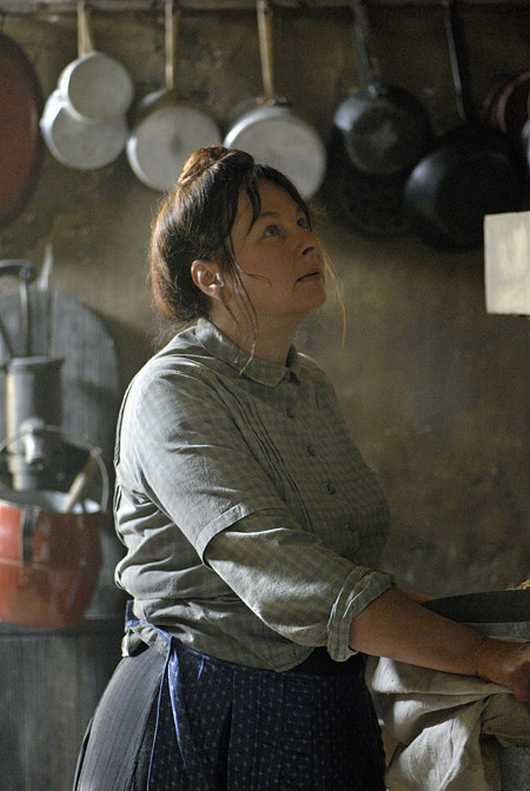 Knowing nothing about the real-life Séraphine de Senlis, I had no idea what to expect — and director Martin Prevost knows how to keep you in suspense. By the time he shows us the full array and impact of a large number of her works, it takes your breath away for its strange, dangerous, utterly original visions. As luck would have it, one of the men whose house she cleans turns out to be a forward-thinking art dealer who’s helping to advance the careers of figures like Picasso and Rousseau. Monsieur Uhde is struck by Séraphine’s gift, and urges her to continue even though, as a German, he must hasten to leave France as World War I approaches. By the time he stumbles onto her some 13 years later her art has matured into a glorious, ecstatic, amazing gift, even as her fortunes have fallen further than ever. Séraphine de Senlis was a true naïf in that she never trained as an artist; she was entirely self-taught. It’s a term that curators and gallery owners use to encapsulate a huge range of artists, and which reveals the snobbery of the art world — as do some of the other terms used, like primitive art and outsider art. These terms are inherently unsatisfactory in that they lump together an enormous range of individuals simply by the fact that they were not formally trained. A better term — at least for Séraphine — is visionary artist. She was, indeed, visionary — in all senses of the word. See this wonderful film and bask in Moreau’s acting and the dramatic reveal of this artist’s spectacular work, in all its glory. 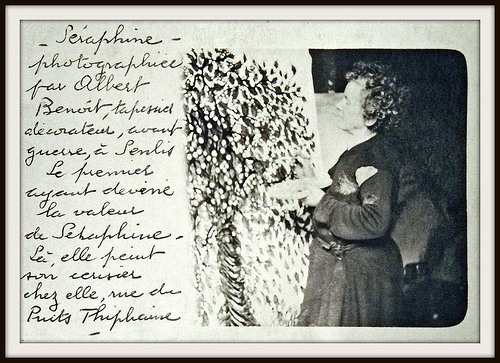 You’ll see why Séraphine won so many prizes, and it’ll make you think about the nature of artistic compulsion and vision.